Emergency plumbing issues can disorganize the state of your Casselberry, FL home. Apart from making life unbearable, it disrupts daily activities and puts makes you uneasy. The moment you notice an emergency plumbing issue in your home, it is important that you call on your Emergency Plumber Casselberry to fix the issue immediately. When your home is threatened by the unexpected setback of leaks, clogs, blocks, or bursts, do not let disorderly plumbing disrupt your household for even a day. You can always rely on A1 Plumbing Service to fix the issue. We are a renowned Casselberry Plumber that is known to provide outstanding plumbing services to residences and businesses in Casselberry, FL and nearby communities. All our services are carried out with a high level of professionalism. 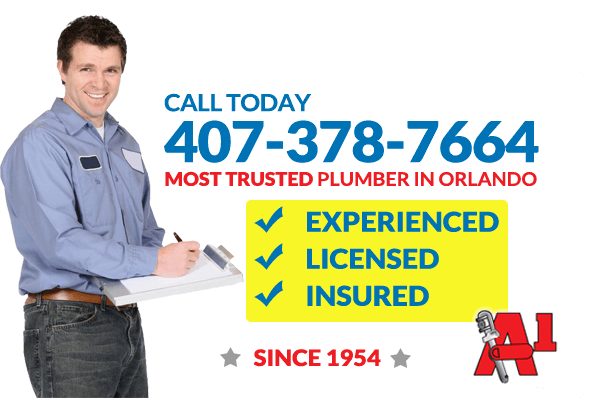 A1 Plumbing Service is the leading emergency Plumber Casselberry that is known to provide Casselberry 24 hour plumbing services. We are always ready to attend to all of your plumbing needs, large or small. We will work round the clock to fix the issue and ensure that your plumbing system returns to optimal working condition. At A1 Plumbing Service, when it comes to the plumbing in your home or business, we understand the importance of prompt service and speedy repairs. Even when you have an emergency issue, our professional Plumbers in Casselberry will get it sorted out once and for all. We specialize in 24 hour Casselberry plumbing services that include water main breaks, urinals, 3-bay sinks, water coolers, disposals, backflow test, repairs, and installations. Even if you have plumbing issues such as wall leaks, slab leaks, hidden leaks, we can get it done. We also offer other plumbing services like electric sewer cleaning, sewer jetting, camera lines, lavatory sinks, and so forth. You probably did not schedule in advance to end your day with the mess of a burst pipe or clogged toilet. So why wait more than 24 hours when Casselberry’s most skilled emergency plumber is available 24 hours a day and 7 days a week, night or day? A1 Service Plumbing has provided the Casselberry community with exemplary results for decades. Whether you are in need of residential or commercial plumbing assistance, A1 Service Plumbing is available for all services including installation, repairs, and regular maintenance. Should you suddenly find yourself with cold or discolored water, a noisy foul-smelling tank, or a sudden unexplained increase in energy bills, do not hesitate to contact your 24-hour plumber in Casselberry for a professional inspection of your water heater. Years of experience, quality workmanship, attention to detail, and ultimate customer experience are some of the things that make us a distinguished Casselberry Plumber. We are known to employ only the best trained and skilled plumbers Casselberry. At A1 Plumbing Service, we always operate under the gold standard of providing excellent service and care with quality workmanship. A lifelong uncompromising commitment to excellence has resulted in providing communities like Casselberry with 24-hour plumber services. Our services are not only reasonably priced and readily available but also licensed and insured and backed by company guarantee. We are always ready to offer you first-class plumbing services that will surpass your expectations. A1 Service Plumbing is proud to carry an A+ rating with the Better Business Bureau, one of many testaments to competent professionalism. Our extensive certification qualifies us to perform installation and repairs on any brand. We back every manufacturer’s warranty with our own guarantee of excellence, so you can sleep (and shower) easy in the knowledge that your plumbing concerns are quickly and adeptly met. Outstanding results and performance are matched only by conveniently affordable pricing. For an added perk, visit our website for access to printable coupons and daily specials offered to keep your emergency plumbing needs within a satisfying budget. You do not have to wait until your plumbing system becomes worse or totally break down before you contact an expert repairer. Call us today for an estimate. We remain the most trusted emergency plumber in Casselberry. Our well-trained plumbing experts are always on ground to provide fast, effective, and long-lasting solution to the recurring plumbing issue in your Casselberry, FL home.